ARLINGTON, Texas (AP) — Bartolo Colon reached out and snagged the comeback liner while slipping into a squat on the mound. The portly 45-year-old pitcher managed to stay upright, with a smile on his face and a ball from his milestone victory secured firmly in his glove. Colon became the top winning pitcher born in Latin America, punctuating his 246th career victory with that nifty snag for the last out of his seven innings as the Texas Rangers roughed up Felix Hernandez and the Seattle Mariners 11-4 on Tuesday night. 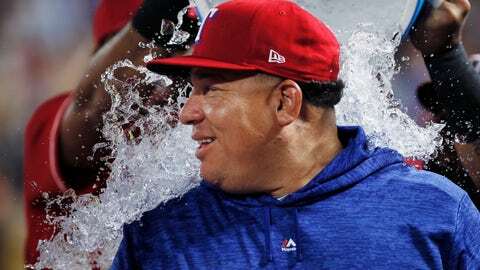 On his sixth try since earning his 245th win on June 30 to match the mark held by Nicaragua’s Dennis Martinez, the Rangers hurler from the Dominican Republic finally had the record to himself. “It was a long journey, but it finally came and it feels good,” said Colon, who got his last out against Dee Gordon on his 94th pitch. Colon (6-10) gave up four runs and eight hits in seven innings. The portly and popular right-hander walked none and struck out one. He retired 14 of the last 16 batters he faced after Seattle had two triples in the third, an inning after back-to-back homers by Nelson Cruz and Kyle Seager . “True to I think the competitor in him, once we got the lead, you could see just the extra little gear that he put it into to get himself through those innings,” manager Jeff Banister said. Beltre, Jurickson Profar and Rougned Odor all homered off Hernandez (8-10), who allowed a career-high 11 runs — seven earned — in six innings. Odor also had a two-run double. Colon is 246-186 in 560 games since his big league debut with Cleveland in 1997, was the 2005 AL Cy Young Award winner while with the Angels and has won games for each of the 11 teams he has pitched for in his career. His 244th victory earlier this season pushed him past Hall of Famer Juan Marichal for the most by a Dominican pitcher. “I always give thanks to God and to my family, all the support that I have from them,” Colon said. When Beltre struck out in the second against his old friend and former teammate, Hernandez laughed while playfully pointing him back toward the dugout. Beltre grounded into a double play in the third, but his 468th career homer was a solo shot to straightway center in the sixth that made it 11-4. Hernandez, whose 168 career wins are the most by a Venezuelan-born pitcher, struck out two and walked four. He was hurt by two errors by third baseman Seager that led to four unearned runs. “I was just bad tonight, didn’t catch them,” Seager said. The Mariners led 3-0 before Texas had a four-run third. Odor’s double made it 3-all and Elvis Andrus had a tiebreaking RBI single to extend the longest active hitting streak in the majors, and his career best, to 18 games. Profar’s three-run homer made it 8-4 in the fifth right after Seager misplayed Beltre’s two-out grounder. Odor’s two-run shot in the sixth was his 14th homer. Center fielder Cameron Maybin then made a running, leaping catch with his glove extended near the top of the wall to take a hit away from Andrus before Beltre put a shot over the wall. Mariners: Maybin was struck on the upper leg while waiting in the on-deck circle in the ninth inning when Chris Herrmann sliced a foul ball. Maybe appeared to be OK, even smiling briefly. Maybin then grounded out. Yovani Gallardo, 6-1 since rejoining Texas in mid-June for the first time since 2015, starts the series finale against Seattle and lefty Marco Gonzales (12-6). While Gallardo has a 4.76 ERA in his past seven starts, the Rangers have averaged an MLB-best 11.57 runs per nine innings with the right-hander on the mound. No AL pitcher has more than his six wins in that span. Gonzales had won five starts in a row with a 1.57 ERA before losing Friday against Toronto.